Electronic poster systems are starting to replace traditional printed posters during presentations at congresses. 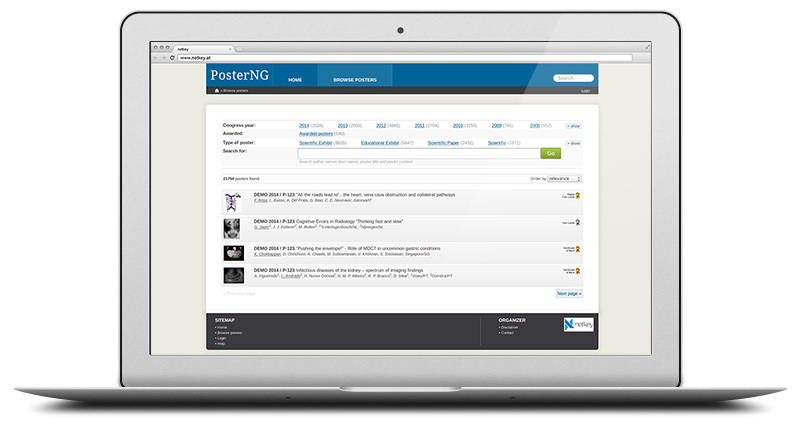 PosterNG is the ideal tool for workflows related to the submission, evaluation and sharing of scientific content. All process steps can be performed online through any current web browser. Published posters are available during and after the congress, both on site and online. Permanent online availability of posters ensures an increased range of topics and reach of your society. Furthermore, a DOI (Digital Object Identifier) can be registered for each poster. This allows readers to create unique references to posters when quoting. If you want to learn more about PosterNG, please download the PosterNG brochure or send us your request for information at contact@netkey.at.